We’re forced to improvise our tactics when a small force of Zhentarim mercenaries arrive in Nightstone. As soon as he walked in the door I bashed him in the head with my staff. I can only imagine the look on his face. I was still disguised as their Zhentarim ally, Kella. “We’re under attack,” someone shouted. Damn! I thought we’d been careful. The Zhentarim mercenaries stopped chasing their horses and drew their weapons. We still had one ace up our sleeve – Halfred in the windmill. One of the Zhents suddenly had an arrow protruding from his eye. I grinned as I let the rush of adrenaline flow freely. The goblins had caught us flat-footed. This time we had surprise on our side. Computer Science is a vastly under served industry. Given how interconnected technology has become, all industries are looking at the next generation of workers to be well versed in Computer Science and engineering. An organization called TEALS (Technology Education and Literacy in Schools) works at the high school level to provide tech-savvy volunteers, curriculum for teachers, and computer lab lesson plans. The goal is to empower teachers and schools to provide Intro level Computer Science courses to prepare young people for an increasingly tech-focused world. And they do it using video games. We’re supposed to “reach for the moon” in our goals. That way if we fall short we’ll still land among the stars. That doesn’t make a whole lot of sense given that the nearest star is several light-years farther away than our moon. But the point is sound. Zeboyd Games’ moon is represented by classic, beloved 90s Japanese RPGs such as Chrono Trigger, Suikoden, and Phantasy Star. It’s a big reason I backed the game on Kickstarter several years ago. To take on some of the best RPGs in gaming with an indie budget and two-person development team is a daunting challenge. While Cosmic Star Heroine falls short in some ways, it still lands among the stars as one of the best games I’ve played this year. 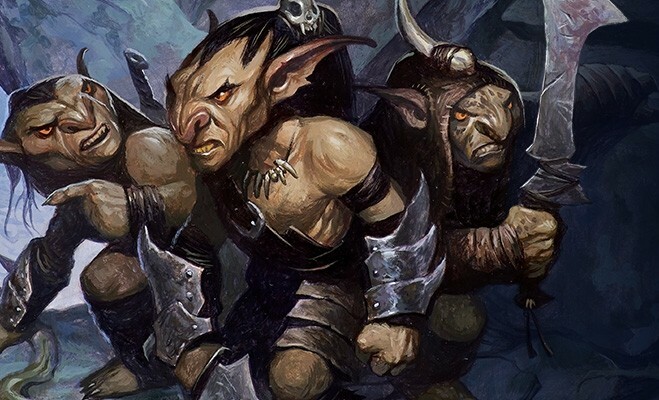 We kill goblin after goblin as we explore the town of Nightstone, but soon the tables are turned as we fight for our lives. The warforged man of wood and metal flew through the air, landing hard, but solidly over the 15 foot gap in the bridge. Before we could formulate a plan to get the others across, a goblin came shrieking around a corner to the North. Damn! We’d pitied the first goblins we came across, leaving one trapped but alive. As recompense it stirred up the hornet’s nest. We thought the town cleared. We were wrong. We easily cut the screamer down, but a trio of goblins poured out of nearby buildings. T.I.M. leapt back across, a bit less gracefully, and received an arrow in the chest in response. Our party was flustered, missing too many shots, while the goblins appeared more galvanized than ever. They’d seen the bodies. They knew what we were capable of. I surrounded myself in a protective barrier and charged them. The vicious beast sneered at my deliberate approach, and his whirling blade sliced right through my spectral shield. A gasp escaped my lips while the goblin yelped backward as the frost burned his skin. I heard shouting behind me, then nothing at all as I fell to the ground. While we patiently wait for Nintendo to confirm and announce the SNES Classic Edition retro console we can have a bit of fun speculating on which games it should include. The Super Nintendo was blessed with arguably the greatest gaming library of any console. While Mario, Zelda, and Metroid didn’t start with the SNES, it was where they became titans of the industry. The NES Classic Edition came bundled with 30 games, most of which were published by Nintendo. Let’s decide which 30 SNES games should grace the upcoming SNES Classic. The long-awaited sequel in a unique steampunk-magic world. Check out my previous Final Thoughts for Rogues’ Adventures. Keep up with my adventures in backlog gaming via the Facebook group. I played the first Dishonored nearly three years ago during Rogue’s Adventures season four. At that point the game was already several years old, and I was able to play all of the post-launch DLC. Our new party comes together, and we begin exploring the strangely abandoned town of Nightstone. Making friends came easy to me; I had made plenty growing up. But none as strange as these. I carefully considered each one of them from beneath the cowl of the midnight-blue robes of my order. The tiefling woman, Bryseis, was the first I met. She was also interested in the tales of the monolith in Nightstone. She seemed powerful, but unpredictable. I didn’t want to pin her obvious demonic heritage on her demeanor, but she seemed to delight in the chaos and magic around her. A halfling tracker named Halfred found us, and he seemed nice enough. He was preoccupied with giants. Apparently they’ve been restless lately, and his path crosses with ours. Despite his size he carries a mean longbow nearly as big as he is. I’d met few dragonborn in my day and Korinn certainly fits my understanding of them: proud, honorable, and quick to action. Despite being a sorcerer she likes to wield a crossbow. I believe she has some kind of military background, and seems to carry it around like a burden. Our final member is stranger than all the rest combined. Calling itself “T.I.M.,” a living construct of wood and metal ambled out of the nearby Ardeep Forest on our way to Nightstone. Despite its grave appearance it was completely friendly – the friendliest one of all in fact. I’m still trying to figure it (him? her?) out, and grew even more alarmed when I witnessed T.I.M. channeling divine power. We came upon the town of Nightstone, and Halfred went to work identifying the muddy footprints outside the drawbridge. The town had seen a mass exodus, while goblins and worgs filed in afterward. We could see a pair of worgs in the middle of the town, their mouths wet with blood as they feasted. Halfred had some concerns about attacking the beasts, but this was our best chance. Bryseis lured one of them closer with a Dancing Lights spell, perhaps enjoying toying with it a bit too much. When it leapt at the lights we fired off attacks, spells and arrows. The beast lay dead before it even reached us. We approached the town gate. Our adventure lay before us. 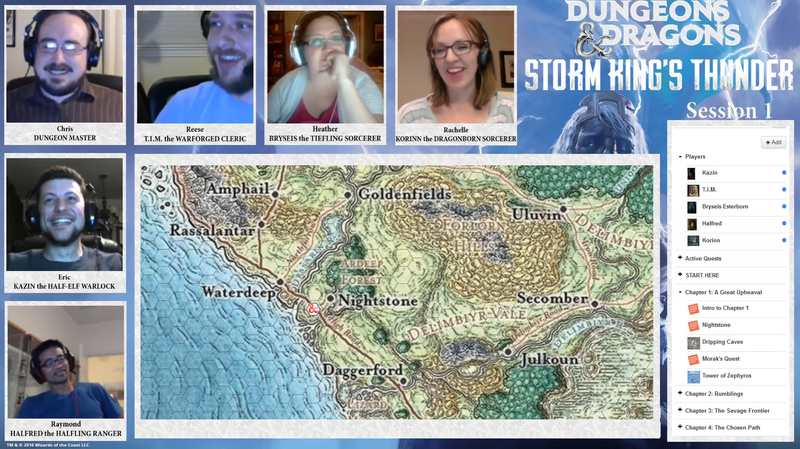 Welcome to four first official recap of “Storm King’s Thunder!” These recaps will be a bit different than our previous campaigns, as I’m not the DM. Instead I’ll include a fun little role-playing story at the beginning of each recap ripped from the session, then dive into the recap from my point of view as a player. I really enjoyed the prologue our DM concocted to introduce our characters and bring us all together. Each little vignette included a skill check or save we had to make – all five of us passed! We are a very diverse bunch with widely different backgrounds but hopefully we can find a way to work together. We met outside the gates of Nightstone, a fortified town near Waterdeep. Our halfling ranger rolled a critical success on identifying the footprints outside the gate, giving us clues that this town was a hostile area. From just outside of town we could see a pair of worgs, though they were busy eating. Worgs are bad news, and often used as goblin mounts. Halfred and T.I.M. had some reservations about attacking them first, but this was our best chance to take them out. We launched a bevy of ranged attacks, Eldritch Blast, Firebolt, Longbow, Crossbow, etc. The first worg lay dead before it reached us, while the other didn’t even notice. I suspect our DM was a little miffed we took out the creature so easily, so when we tried to get a bit closer before unleashing a similar assault, the second worg noticed us and charged, using Dash to close in fast. Still we got off a ton of attacks and downed it quickly. The town resembled Thundertree from our Phandelver campaign; an outdoor dungeon with buildings to explore. And holy crap was it huge! I’m not a fan of the way the map simply halved the grid size, making all our tokens super tiny even when zoomed in all the way. But the sheer scale of this town is damn impressive and intimidating. We checked out the temple first, since the bell hadn’t stopped ringing since we arrived. Inside was a pair of goblins happily pulling the rope of the bell. A fight broke out when I opened the door. Thankfully they both missed me, and I was able to murder one with a single blow from my staff. I used Awakened Mind and the fact that we were five against one to talk the other down from fighting and try to get some information. The goblin was forthcoming but didn’t really know much. The town was empty when they arrived, and they were simply looting. The rest of the party asked their questions but no one knew how to deal with him. We decided to cut the rope, barricade the door, and trap him inside for now. From there we scoped out the nearby inn. The town was full of giant rocks that had done significant damage to everything; the inn had massive holes from the ceiling down to the ground. The inn contained a dead goblin and a fully functioning bar, huzzah! Unfortunately the Dynamic Lighting for the Roll20 campaign package screwed up a bit here, as we could see beyond the next room and the goblin that lay within. We didn’t really plan anything and just opened the door, finding the goblin with a giant loot sack. He charged and did some nasty damage. We outnumbered him five to one and it still took us two rounds to take him down. T.I.M. had to cast Cure Wounds! The lootsack was mostly full of crap, with a few broken treasure items we could sell. The upstairs of the inn contained a number of doors and Halfred impressed once again with a 25 Perception roll. One room contained a strange woman who seemed bewildered by the attacks and looting. I made an Insight check with a 15, and could tell she was lying. Things got a bit tricky here, as this woman eventually revealed herself to be a member of the Zhentarim, which apparently features into Bryseis’ backstory. That’s nifty, but Bryseis’ response was to attack her, while the rest of the party wanted more information. I mean hell, they didn’t want to attack the blood-thirsty worgs, of course they’re going to need more to go on here! After a bit of arguing and information-gathering (the Zhents wanted to move in and take over, but we did learn that the rocks and damage was caused by a floating cloud giant castle, whoa!) Bryseis reached out to cast Shocking Grasp and get the party started. In close proximity it was a simple back and forth trading of blows, though the spy had multiattack and cut me up pretty bad. I used Dissonant Whispers to drop her dead from psychic assault in response. Clearly the tiefling has some explaining to do, and we may need to make some ground rules for our party going forward lest we fall apart before our story gets started.